[Via Satellite 11-12-2014] MacDonald Dettwiler and Associates (MDA) is optimistic it can capture new business in the small satellite market through its subsidiary Space Systems Loral (SSL). 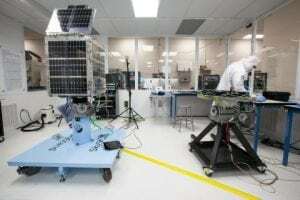 In February 2014 Skybox Imaging partnered with SSL to build 13 small Earth imaging satellites known as “SkySats.” Skybox built the first two satellites, SkySat 1 and SkySat 2, on its own before turning over large scale manufacturing to SSL. As part of the agreement, SSL gained intellectual property rights that the company hopes to use to win more small satellite business. SSL is headquartered in Silicon Valley where a number of entrepreneurial space companies are located — including Skybox. SSL has expressed a strong interest in working with satellite startups, having also partnered with NanoRacks for the U.S. Air Force’s Hosted Payloads Solutions (HoPS) program. Existing relationships and geographic proximity to startup companies operating in this sector have created an ideal situation for SSL. Speaking during MDA’s third quarter 2014 earnings call, MDA President and CEO Daniel Friedmann said this was a market that was never anticipated when acquiring SSL, but one that has great potential for new contracts. SSL’s Vice President of Business Development, David Lackner, confirmed the company is working hard to become the partner of choice for new entrants. MDA has been very intentional about increasing SSL’s satellite manufacturing capacity to maintain a competitive edge, though he did not disclose exactly how the company plans to do this. In the long run, Lackner said SSL’s goal is to be as diverse as possible. SSL’s growing product line for small satellites meshes knowhow and practices from building larger satellites, such as those that use the SSL 1300 bus, with knowledge gained from Skybox. Likewise, new small satellite technology is having an influence on other products. Lackner said the company is currently looking at a broad range of commercial and government applications; the majority for remote sensing projects, but SSL small satellites are not limited to this purpose, he said. Friedmann identified the Low Earth Orbit (LEO) marketplace as a new focus for both communications and additional Earth observation projects. To date the company has already seen interest, though he said most are for single satellites, rather than full constellations. Friedmann cautioned that it is too early to tell if any of these will turn into contracts. If Skybox, now owned by Google, were to order more satellites, he said MDA would have enough notice to prepare. For now, Lackner said SSL would continue to diversify its product line to gain business from those seeking satellites of all sizes. “SSL is committed to pursuing small satellite contract awards as a critical path to growth and we are actively looking for this type of opportunity. We see this as key to our future strategy of expanding the product line and bringing a Silicon Valley mentality into the aerospace community,” he said.